Herrington Park Log Cabins York01904 607354work Self-cateringLocated in the peaceful village of Sutton on Derwent are the eight luxury log cabins known as Herrington Park. Situated in a tranquil setting on the edge of the village. Each log cabin is set in its own spacious grounds of 1/4 to 1/3 of an acre surrounded by trees and shrubs, ensuring the maximum privacy for guests. Each cabin is surrounded by spacious lawned areas. The log cabins sleep between two and six people, are well maintained, decorated in a contemporary style and equipped to a high standard including leather reclining sofas, widescreen LCD digital TV and DVD player. All Log cabins have Hot Tubs, WiFi, electricity and towels included. An ideal base for visiting York and the surrounding area, arrival from 4pm and departure by 10am, late arrival on request. Easy access to Yorkshire Moors, Wolds and Coast. 3 miles from York Maze and The Yorkshire Air Museum. 2 & 3 Bedroom Lodges all with private hot tubs, each set in their own mature private grounds of 1/4 to 1/3 acre. All Lodges include hot tub, towels, bed linen, electricity and WiFi. Weekly start dates are FRIDAY, SATURDAY OR MONDAY. Sorry no 1 night stays. Herrington Park Log Cabins York offers weekly bookings starting on Saturday and sometimes short breaks. Located on the edge of the village of Sutton on Derwent are the eight log cabins known as Herrington Park. 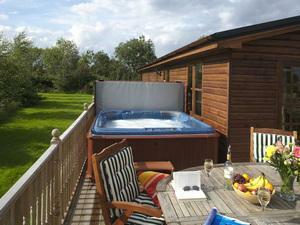 All log cabins include Hot Tub & WiFi and are situated in a peaceful, relaxing setting. This is a family friendly site. A very nice place indeed, far bigger than it looked in the pictures and considering there's a 6 person hot tub even the price is reasonable. Thank you for taking the time to review your recent stay with us at Herrington Park Holiday Lodges York, we are extremely pleased you enjoyed your stay in our log cabin and found it more spacious than you anticipated. We hope that you will return to stay in our log cabin near York again in the future. From the A64 leave at exit York/Hull A1079, leave the roundabout at Hull A1079 exit and immediately turn right at the traffic lights onto the B1228 to Elvington Drive through Elvington into Sutton on Derwent past the St. Vincent Arms and we are 800 yards on the left. We are located within a village, children' play area within walking distance, water sports, golf, and fishing nearby. Each log cabin has a large lawn garden area, outdoor deck with a table, chairs and hot tub, barbeques are available. Children welcome from any age.